Beyond providing data for all 32 NFL teams, PFF also supports network broadcasters with game-preview packets that are used to enhance the in-game experience for fans and viewers. 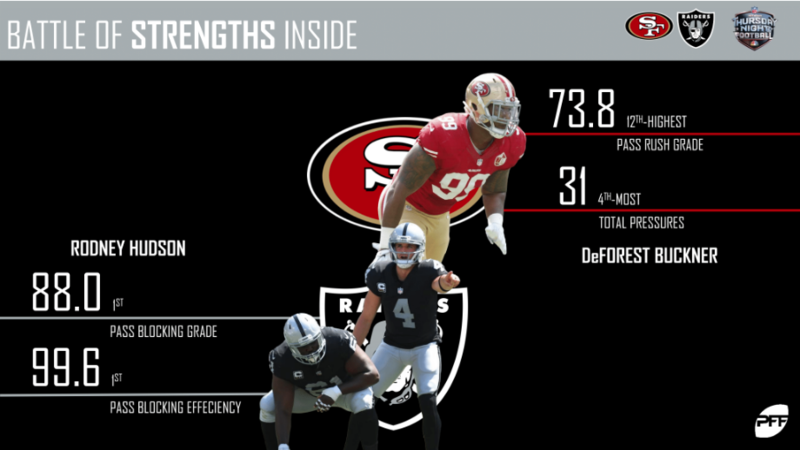 This Raiders-49ers preview features the same information our broadcast partners use for team research and in-game production. Derek Carr has the highest adjusted completion percentage on throws of 20 yards or more in the NFL this year. 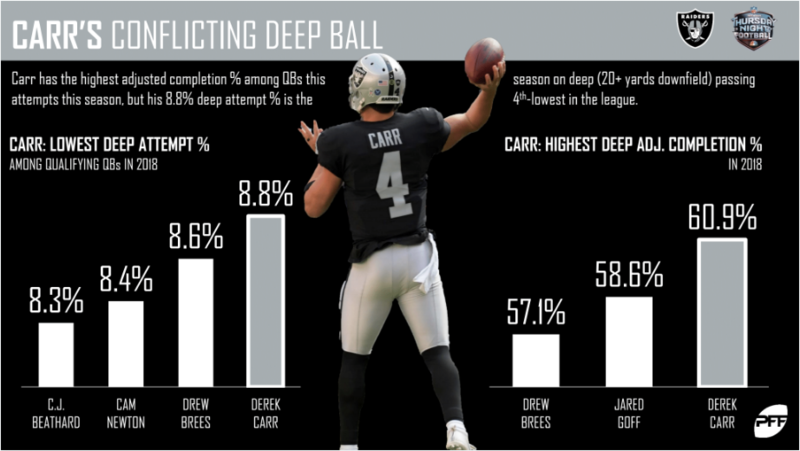 Despite his accuracy, Carr is only attempting a deep pass on 8.8% of his throws. 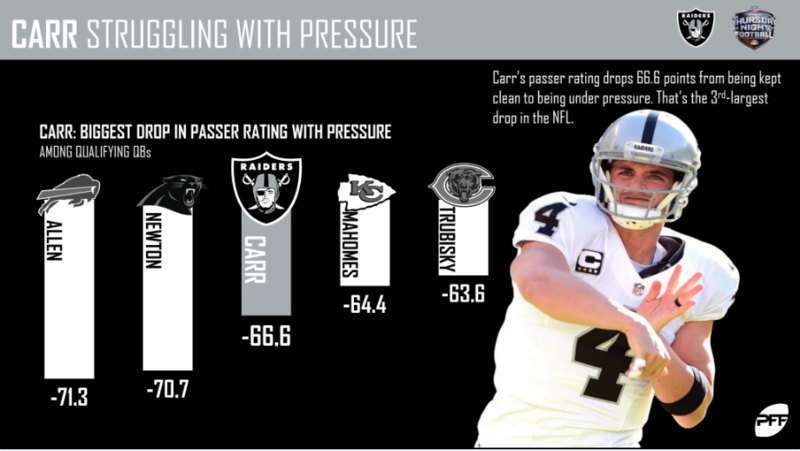 Derek Carr has been a different quarterback when he’s faced pressure this season. 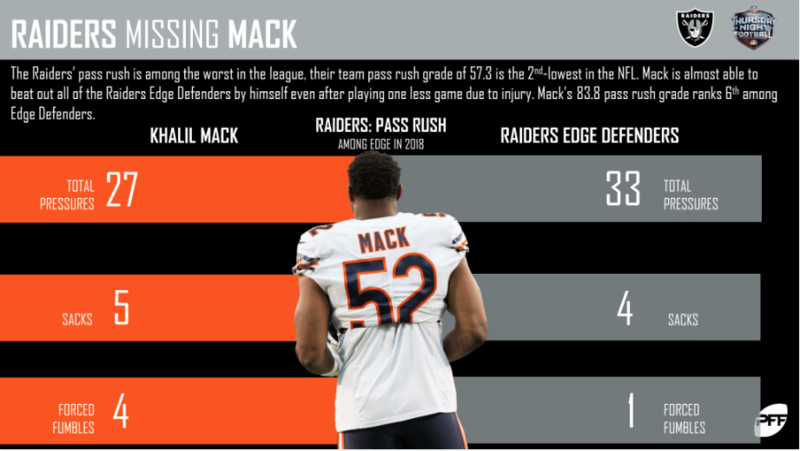 Missing the presence of Khalil Mack has been a storyline all season – and for good reason. Mack has more sacks and forced fumbles than all the Raiders edge defenders combined. 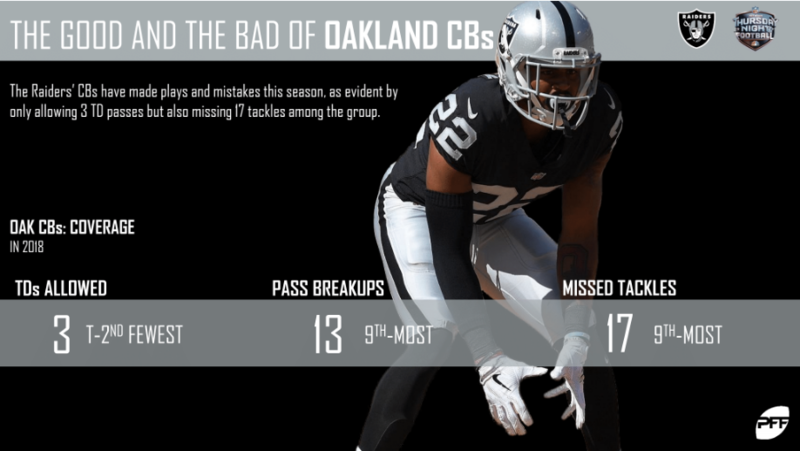 The Raiders cornerback unit has shown a lot of promise in 2018, but they have also made their share of mistakes. 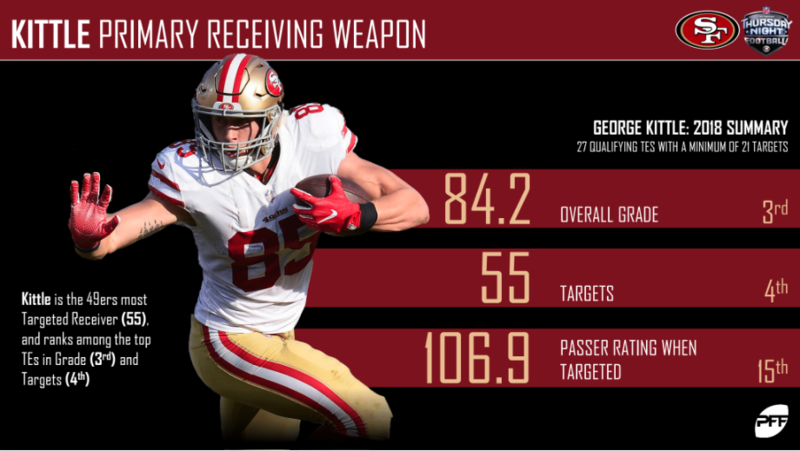 The second-year tight end, George Kittle, is proving to be a weapon the 49ers can build on for the future. 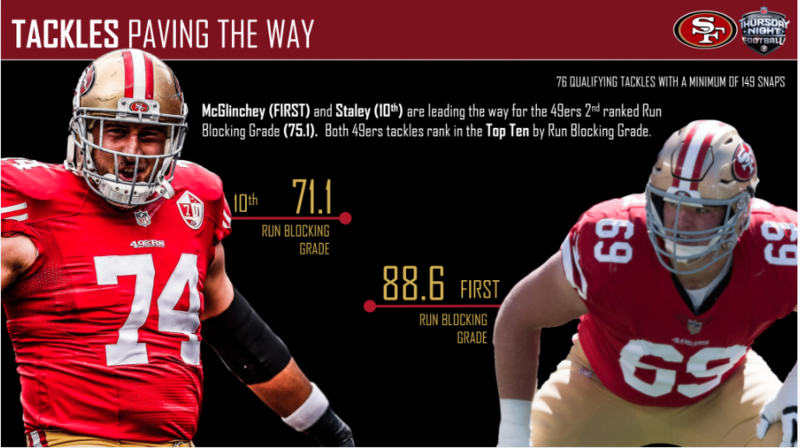 Mike McGlinchey and Joe Staley may be at opposite ends of their careers, but the two are both responsible for powering the 49ers second-ranked run-blocking attack. 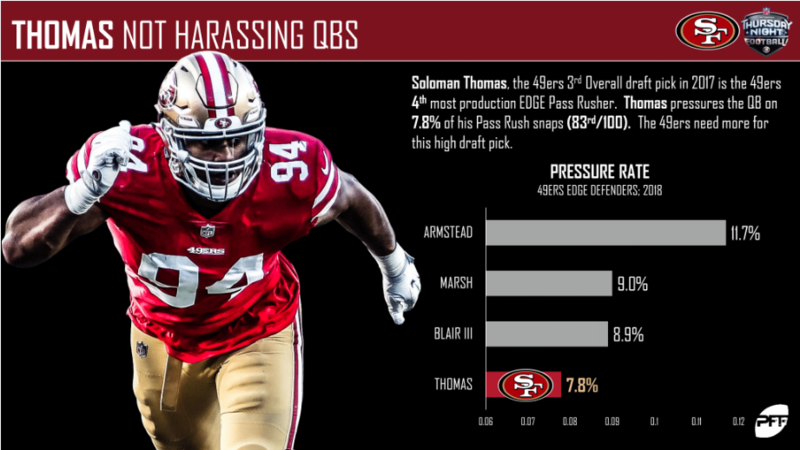 The 49ers rank 26th in team pass-rush grading, and they’ll need players like Solomon Thomas to step up if they want to improve. 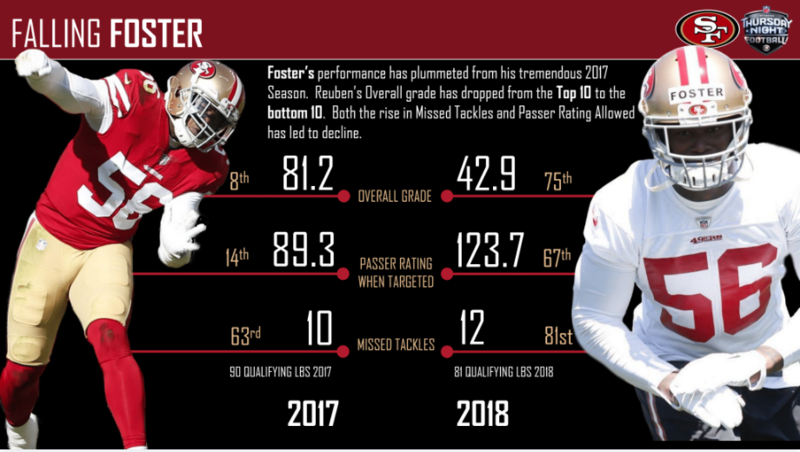 Reuben Foster’s production has significantly decreased over recent weeks. PFF Greenline has projections for the spread, moneyline and over/under of the Raiders’ matchup with the 49ers. Get its picks here.